10 oz (283g) Kumquat 1 Cup Sugar 1/2 Lime PREPARATIONS: None. DIRECTIONS: 1- Place kumquats in a small pot. 2- Pour in enough boiling water to cover the kumquats. 3- Bring the water to a boil over medium heat, simmer for 10 minutes. 4- Drain the kumquats and put them back in the pot, add boiling water and heat for 10 minutes. 5- Repeat the step 4 one more time. 6- Drain the kumquats for the final time. SYRUP 7- Place sugar in a pot, add 1/2 cup of boiling water. 8- Heat the pot for 10 minutes until thickened. 9- Add the kumquats to the sugar mixture. 10- Continue the heat (low heat) for 15 minutes or until the kumquats are translucent. 11- Squeeze half of fresh lime into the pot and stir until combined. 12- Continue the heat for a minute or two. 13- Turn the heat off and allow to cool down. Kumquat is small but when it comes to benefits it can beat its buffer relative, orange. Raw kumquat contains very high amounts of vitamin C. It's also a good source of vitamin A. Kumquat usually comes around winter times and that exactly when our body needs more supply of vitamin C and vitamin A. Due to high amounts of vitamins and antioxidants of kumquat, as it's necessary to boil the kumquats for this jam recipe, it still reserves most of its benefits. Kumquat contains anti-cancer agents. It can also be helpful in prevention of cardiovascular diseases. Just like most jams, Kumquat jam is also high in sugar and people with diabetic condition should avoid it. Speaking of diabetes, Kumquat contains very high amounts of vitamin C which may prevent diabetes. It also contains considerable amounts of omega 3 and may lower cholesterol. 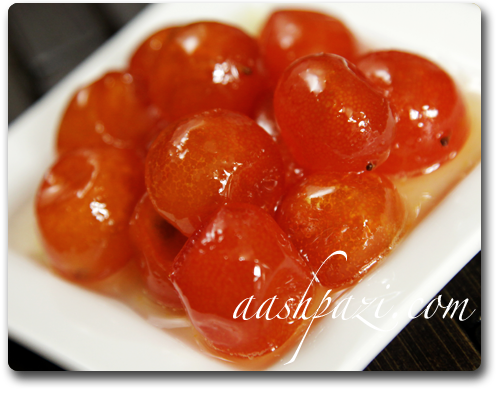 Kumquats are also believed to be a good natural anti aging treatment. 3.5 oz (100g) of Kumquat jam has 197 calories (5 calories from fat), 46.9g of sugar and 50.7 grams of carbohydrates.